Am 13. November 1994 nahm Bruce Springsteen am “11. Love Ride” teil. Erstmals wurde diese Motorrad Benefizveranstaltung im Jahre 1984 von Harley-Davidson Händlern und diversen gemeinnützigen Organisationen in Glendale, CA durchgeführt. 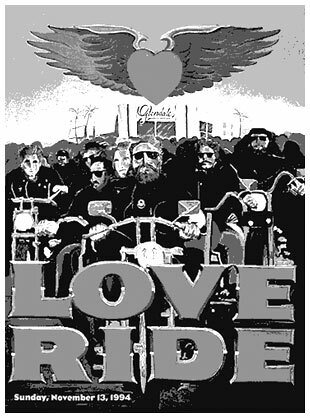 Schon bald war der “Love Ride USA” die grösste Motorradveranstaltung der Welt mit weit über 20.000 Teilnehmern. 1994 führte die von Budweiser, RC Cola und 7 Up gesponserte Motorradtour von Glendale bis in die knapp 50 Meilen entfernte Kleinstadt Castaic. Unter den Teilnehmern waren Axel Rose, Jay Leno, Larry Hagman, Pamela Anderson und Brett Michaels, Peter Fonda, Robert Patrick und Bruce Jenner. Zum Abschluss der Benefizfahrt fand am Abend des 13. November 1994 am Castaic Lake ein Konzert mit Jackson Browne statt. Der damals 46jährige Künstler spielte mit befreundeten Musikern (unter anderem Eric Burdon und Jimmy Witherspoon) drei Sets und sammelte Spendengelder für die “Muscular Dystrophy Association”. Zum Ende der dritten Show kam Bruce Springsteen auf die Bühne, um mit Jackson Browne die Songs “Running On Empty”, “Born to Run”, “(Get Your Kicks On) Route 66”, “Not Fade Away” und “Born to be Wild” zu performen. Eleven years ago, Oliver Shokouh, owner of Harley-Davidson of Glendale, California, began a love affair which continues today. His annual Love Ride, held each November to benefit the Muscular Dystrophy Association (MDA), has grown into one of the country’s biggest charity events. The 1994 ride, held last fall, once again raised more than $1 million in just one day. An estimated 21,000 motorcyclists riding every brand of motorcycle gathered for the 50-mile-ride, which began in Glendale and ended with a concert, barbecue, trade show and carnival at Castaic Lake. Numerous celebrities on hand included Jay Leno, Grand Marshal Peter Fonta, country singer Dwight Yoakam, actors Larry Hagman, Judd Nelson and Darren Burrows, Olympic Gold medalist Bruce Jenner, actress Crystal Bernard and rocker Bruce Springsteen.